Those who have been anxiously following the court case between the Warburg Library and University of London had some good news this week when the High Court ruled in favor of the library. The case is somewhat complex, but it is summarized here in the press release by the Warburg. The library is not out of the woods just yet however. The university is preparing to appeal the decision. This news prompted me to revisit my blog post, "The Warburg Institute, Jewish Refugees, and European Scholarly Networks," which I uploaded in June. 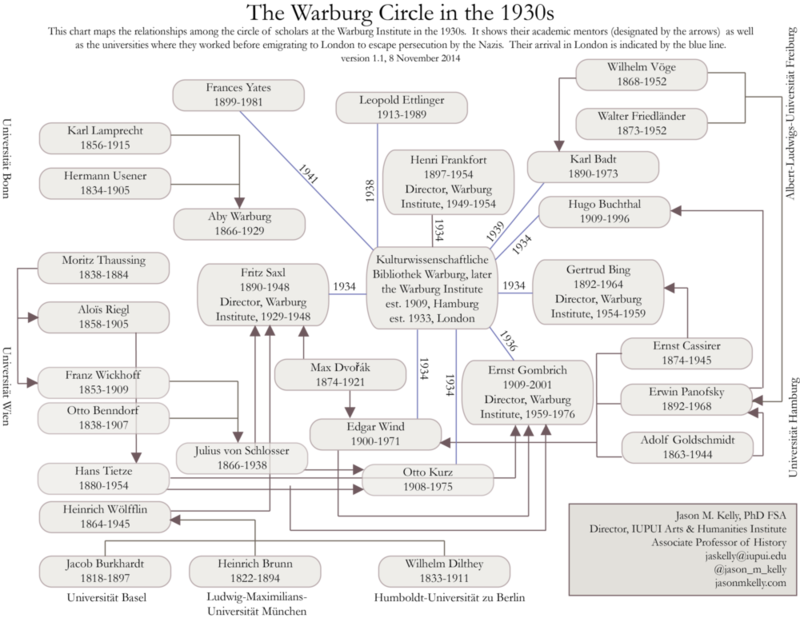 In that post, I mapped out the network of the Warburg Institute's scholarly circle, including mentors and the universities where with which individuals were affiliated -- in effect, it was an intellectual family tree. I've now made some revisions and added scholars to the chart, which I have updated below. The arrows designate the relationship between mentors and students. The blue lines indicate the year that each scholar arrived at the Warburg in London.